What is the Offshore Wind Innovation Hub (OWIH)? The Innovation Hub is the new UK coordinating body for offshore wind innovation. The OWIH will work closely with both industry and government to make sure the UK’s innovation work is joined up and effective. Who is delivering the OWIH’s activities? The OWIH is being jointly delivered by the Offshore Renewable Energy Catapult and Innovate UK’s Knowledge Transfer Network (the ORE Catapult and KTN). Who is funding the OWIH? The Department of Business, Energy and Industrial Strategy (BEIS) is funding the OWIH from 2017/18 to 2019/20. Innovate UK provided seed funding in 2016/17. If I’m not a member of the Technical Advisory Group, can I still contribute? Yes. We are in the process of formalising how this process will work, but we wish to create opportunities for all supply-chain participants to advise on their priorities, through our website and/or through moderated events. More details will be announced in the coming months. What will the OWIH do? The OWIH will provide a coordinated UK approach to offshore wind innovation. It will provide a consolidated view of the priorities for offshore wind innovation, enable public funding bodies to better coordinate their support for the sector and communicate and promote the outcomes of innovation projects. How does OWIX – the Offshore Wind Innovation Exchange – fit in? OWIX is one of the Innovation Hub’s first programmes. This cross-sector scheme will accelerate cost reduction by matching industry challenges with innovative solutions adapted from other parts of the economy. It will provide new opportunities for UK business across industries to participate in offshore wind. How will OWIH simplify the UK offshore wind innovation space? OWIH is offering a single information point for forthcoming funding calls and is developing a central innovation roadmap that will be agreed and accepted by both industry and government. The OWIH Advisory Group is closely linked to the Offshore Wind Industry Council’s Offshore Wind Programme Board, which will no longer require its own innovation sub-group. How will the OWIH work with industry? Innovation priorities: Maintaining a technology roadmap for delivering the industry’s priorities. This displays current technology innovation priorities for the offshore wind industry. The roadmap outlines the market opportunity for technology providers and shows how cost reductions can best be achieved. Targeted R&D project brokering: Convening groups and helps to broker new R&D partnerships, often in response to upcoming funding calls. It supports consortia building, including with companies outside of the offshore wind supply chain through its OWIX programme. This will improve the chances of the offshore wind industry getting funding and will build stronger cross-sector partnerships. It also signposts companies to the most appropriate technical or financial support options to improve the success of projects. Dissemination and technology showcasing: drawing insights from funded projects and publishes findings and data online, using case studies to explain the outcomes and impacts of innovation projects. It promotes the UK industry’s success stories to audiences at home and abroad, helping the Foreign and Commonwealth Office and the Department of International Trade showcase the UK’s great companies, technologies and services. How will the OWIH work with government? Central information point: providing departments and agencies at all levels of government with a single source of information on the sector’s innovation priorities and progress. This will help avoid overlap and duplication, drive down the cost of offshore wind energy and create a more vibrant UK supply chain. OWIH will collate outcomes from publicly funded projects to provide richer data to inform innovation priorities. Scoping: guiding innovation priorities at BEIS, Innovate UK, Research Councils and the regions to help them increase value for money, avoid funding overlaps, and align innovation support efforts. International engagement: linking with platforms and initiatives in Europe and internationally (like the International Energy Agency) to help reflect the UK’s priorities in their objectives and activities. It will work with government export-focused bodies to promote UK successes. How is the OWIH different than ORE Catapult? Coordination: ORE Catapult’s core mission does not extend to the sector-wide coordination that has been identified as a gap in the innovation landscape. The OWIH will fill that coordination gap. Technical expertise: ORE Catapult is a centre of deep technical expertise, offering support for technology validation and development. The OWIH signposts industry to the best technical support entity (ORE Catapult or otherwise) rather than housing technical expertise itself. Technology roadmapping: This function had no UK-wide owner before the OWIH was established. OWIH’s engagement with industry and others is designed to ensure it can generate and maintain a validated, comprehensive roadmap for UK innovation in offshore wind. International engagement: ORE Catapult is focused on offshore wind innovation in the UK. The OWIH has a specific remit to represent the UK’s innovation priorities and promote our successes in international bodies and programmes. How is the OWIH different than KTN? Convening: KTN’s core objective is to support UK business-led innovation around the requirements of Government funding programmes and policies. The OWIH has a specific remit on offshore wind. It enables KTN to take a sectorial approach that (a) works directly with offshore wind sector to help meet the cost reduction targets and increase UK content in the supply chain, and (b) dedicates resource to facilitate new collaborative R&D partnerships. Showcasing: KTN’s current showcasing scope does not extend to cover offshore wind. The OWIH will showcase UK offshore wind innovation and success widely to national and international government agencies, investors and businesses from other sectors. International engagement: KTN actively support Newton Fund and Prosperity Fund international innovation activities. The OWIH has a specific remit to represent the UK’s offshore wind innovation and this will be a new focus for KTN in partnership with ORE Catapult. How is the OWIH different than the Offshore Wind Accelerator? The OWIH will consolidate the priorities of the whole offshore wind supply chain, and so allow funders a basis to coordinate their efforts. 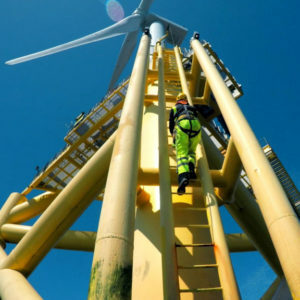 The OWA is a successful programme of projects that are of mutual benefit to the main offshore wind project developers in the UK, which acts as an important adjunct to public sources of funding. The steering bodies for OWA and OWIH will have some shared membership to ensure OWA priorities are incorporated in OWIH’s UK technology roadmap and to allow early identification of where the OWA can help progress priorities on the UK technology roadmap. Can I apply for funding from the OWIH? No. Rather than funding projects itself, the OWIH is helping industry to bring high-quality, relevant responses to funding programmes like those run by Innovate UK, the devolved administrations and European innovation funding calls.